Cautious Clay is having an incredible year. After releasing two EPs, hitting venues across North America, and performing at the Soul Train Awards, the singer/producer/multi-instrumentalist will wrap up 2018 by performing at the Bandsintown Big Break showcase presented by Finn by Chase. 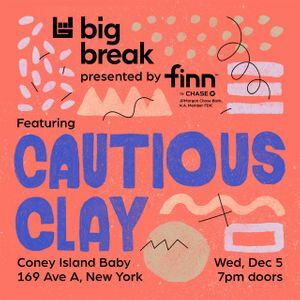 Hear the Brooklyn-resident's captivating blend of R&B, hip-hop, and indie-electronic at Coney Island Baby on December 5th. Drinks and food will be served, so all you have to do is RSVP to catch the show! The free show is presented by Finn by Chase, the all-mobile bank that helps power smart spending and saving for the things you love—like a live show featuring your favorite artist. Finn helps you plan for the future and enjoy the now.